Hunting is a tough job nowadays. A bit of running and a loud ROAR every now and again used to be sufficient but those cocky animals are not the least impressed anymore. Leo had a new plan. 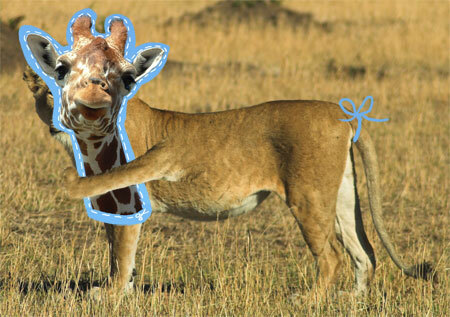 Why not pretend to be one of those yummy longnecks… He took a few snapshots, picked the one with the most innocent face, cut out the photograph and tied a handsome blue ribbon round his tail. Giraffes tend to fall for that kind of stuff, you know. Hahaha. Ik zal hem aan Stach laten zien. Kijken wat hij ervan vindt. Al zit hij nu inmiddels in zijn groenteperiode.